Satellite imagery from NASA's Terra and Aqua satellites showed that Hurricane Katia had not moved much, just about 30 miles in 16 hours. On Sept. 6 at 3:25 p.m. EDT (1925 UTC) the Moderate Resolution Imaging Spectroradiometer or MODIS instrument aboard NASA's Terra satellite captured a visible-light image of Katia in the southwestern Gulf of Mexico. The image showed powerful bands of thunderstorms around the center of circulation. The western quadrant of the storm was over the east coast state of Veracruz, Mexico. At the time, the center of Katia was about 185 miles (295 km) east of Tampico, Mexico. Katia strengthened into a hurricane on Sept. 6 at 4 p.m. CDT (5 p.m. EDT). On Sept. 7, the National Hurricane Center (NHC) said a Hurricane Warning is in effect for Cabo Rojo to Laguna Verde, and a Tropical Storm Warning is in effect from north of Cabo Rojo to Rio Panuco and south of Laguna Verde to Puerto Veracruz. 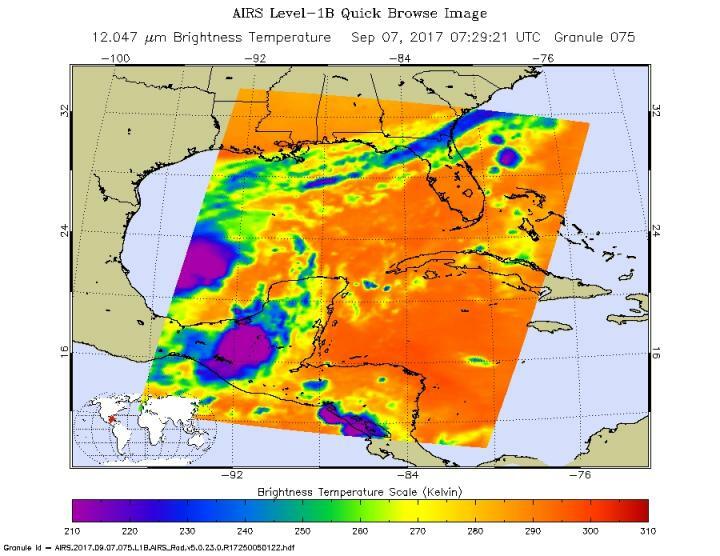 The Atmospheric Infrared Sounder or AIRS instrument aboard NASA's Aqua satellite measured at cloud top temperatures in Hurricane Katia's eastern side using infrared light. The AIRS data were taken on Sept. 7 at 3:29 a.m. EDT (0729 UTC). The data showed some very cold cloud top temperatures as cold as minus 63 degrees Fahrenheit (minus 53 degrees Celsius). NASA research has shown that storms with cloud tops that cold are high up in the troposphere and can generate heavy rainfall. The infrared data was false-colored at NASA's Jet Propulsion Laboratory in Pasadena, California, where AIRS data is managed. Puebla, and San Luis Potosi." At 10 a.m. CDT (11 a.m. EDT/1500 UTC) the center of Hurricane Katia was located near 21.6 degrees north latitude and 94.6 degrees west longitude. That's about 215 miles (345 km) east of Tampico, Mexico. Katia is stationary and little overall motion is anticipated through late today. However, the hurricane is forecast to turn southwestward and approach the coast within the warning area late Friday or early Saturday. Maximum sustained winds are near 80 mph (130 kph) with higher gusts. Some strengthening is forecast during the next 36 hours and Katia could be near major hurricane strength at landfall. Hurricane-force winds extend outward up to 10 miles (20 km) from the center and tropical-storm-force winds extend outward up to 45 miles (75 km). The minimum central pressure estimated from Air Force Hurricane Hunter observations is 980 millibars. The National Hurricane Center forecasts Katia to move in a southwesterly direction and make landfall late on Friday, Sept. 8.